One of the funny things with Nike (NYSE: NKE) stock is that if you compare it to the rest of its industry it will always appear to be extremely overvalued because its earnings are much higher quality. That’s despite the current situation where the stock is down some 20% over the past ten months and trades at around 21x forward earnings. The reason for the most recent fall came off the back of its quarterly earnings report – where despite the fact that the company beat both top and bottom line estimates the stock ended up dropping something like 4-5% straight off the back of the earnings release. Whenever you get a stock that has ended up on a huge tear over a three or four year period then you’re always susceptible to that kind of behavior. The actual results weren’t even that bad. I guess if you were being objective you’d probably say they were a mixed bag. The good points were that revenues were up 7.5% in dollar terms and by about 10% on a constant currency basis. That topped estimates, as did earnings per-share of $0.73 for the quarter. The bad news was that margins contracted and future orders came in weaker than expected. This is the short-term danger that is ever present when investing in a stock that has seen significant proportion of its returns driven by an expanding valuation multiple. Check out the average P/E ratio of Nike stock over the last five years to see what I mean. What you also had fueling that expanding valuation multiple was the incredible growth of the underlying business. As a Nike shareholder in 2011 you saw the company report full year revenue of $10.35 per-share and earnings of $1.13 a share. By 2016 those figures had grown to $18.55 and $2.16 respectively. When you get that dual tailwind to stock returns – huge earnings growth and expanding value multiple – it sets up a situation where it only takes a tiny knock to hit the share price quite hard. To see what I mean by that just project some earnings growth figures over say a five year period. Back in December of last year you get the stock trading at 30x earnings and a share price of $64.50. Let’s imagine you make an investment and that you expect to see returns of 8% without factoring in dividends. You also pencil in a more sensible future P/E ratio of 20x earnings. The question then you then have to ask is what does that translate to in terms of Nike’s underlying business? Let’s work through it. Over the next five years to get an average of 8% a year share price appreciation would imply a stock price of $94.75 by 2021. 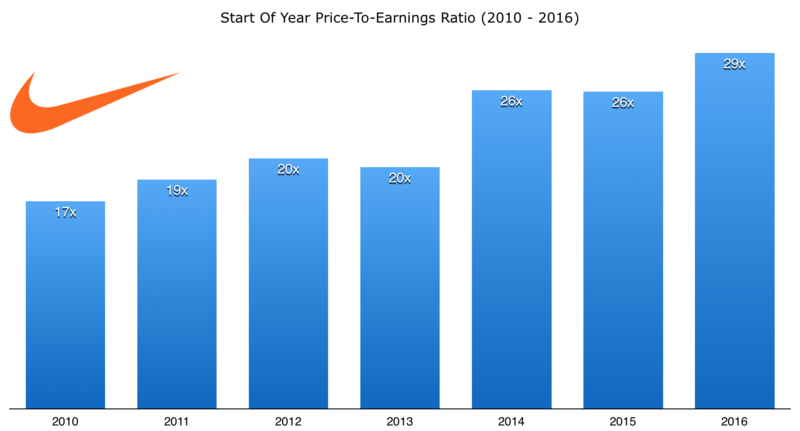 At a P/E ratio of 20x earnings that would require earnings-per-share of around $4.75. In fiscal year 2016 Nike managed to earn $2.16 a share in net income. On that basis the company would therefore have to grow earnings by around 17% a year on average up to 2021 to satisfy all of that criteria. Now that may or may not sound realistic to you, although it’s certainly a decent clip ahead of both their last five and ten years’ worth of earnings-per-share growth. Even if you thought that were possible though the fact is that there is fairly limited margin of safety there if you’re only looking at the medium-term. Over the long-term I still think you could put Nike stock into the category of delivering acceptable investment returns even if you were buying it at 30x earnings back in December 2015. It just takes time to work your way through the burn-off period from a relatively high P/E ratio – and that inevitably involves short-term volatility. Okay so let’s take a look at the stock right now then. The P/E ratio has come back down to a better looking 23.5x their full fiscal year 2016 earnings (Nike’s financial year ends in May). In order to better reflect the situation that prospective Nike shareholders are in let’s use the same conditions out to 2021. In other words you want to see 8% capital appreciation (we’ll come to the dividends in a moment) and you factor in a future P/E ratio of 20x earnings. Let’s work through it. To see 8% capital appreciation per-year over the next five years from the current stock price of around $51 a share implies a future share price of just under $75. At a P/E ratio 20x earnings that means Nike should be reporting earnings-per-share of $3.75 in fiscal year 2021. 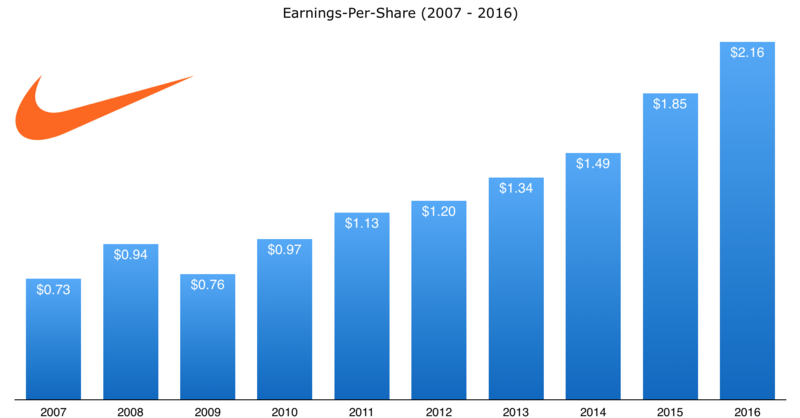 In turn that would require earnings-per-share growth of about 11.50% over the next five years – a figure more in-line with previous growth rates. Additionally shareholders could conservatively expect Nike to pay out at least another $3.80 per-share by way of cash dividends over that time frame – bumping the total returns up by 1-1.5%. When I first wrote about Nike stock on the site I said that at $55 per-share it was starting to look pretty attractive as a long-term investment. As it goes lower towards the $50 you could possibly amend that to even a medium-term horizon. I’m not saying that the projection above is going to happen – that’s just to show the kind of growth figures you need to see to justify your expectations. It could be that the earnings multiple collapses to between 10-15x earnings for whatever reason. Or that earnings come in way lower than even fairly conservative estimates. What it does show though is that the expected value of an investment in Nike stock is looking better and better – and to state the obvious when you’re dealing with high quality companies – the more it falls, the more attractive it gets.